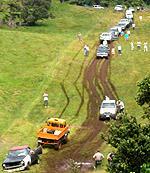 The Kahuku Ranch is a working cattle ranch on the Kona side of the Big Island near South Point. 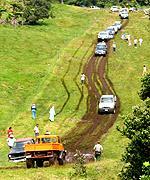 The ranch spans the slopes of Mauna Loa from 2,000 feet to over 13,000 feet above sea level. 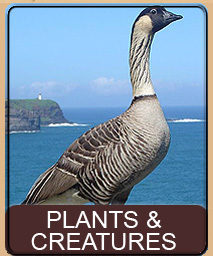 The 116,000 acres of the ranch are home to a diverse ecosystem of native plants and endangered birds. 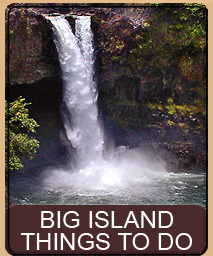 The ranch area is also home to a number of ancient Hawaiian archeological sites as well magnificent natural lava formations. On July 3, 2003, the Hawai'i Volcanoes National Park announced that together with The Nature Conservancy they had jointly purchased the Kahuku Ranch and included it as part of the Hawai'i Volcanoes National Park. 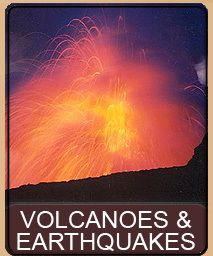 On September 2, 2004, the Hawai'i Volcanoes National Parks held an official dedication ceremony that was followed by a scenic drive through a portion of the ranch land. This one-day event was open to the public, after which the ranch would be closed as it underwent 'parkification'. Because this was a one-time event, we are giving it to you here first, for the record. Second because in a couple of years this area will be open to the public as an official park it will be interesting to see what changes the park introduces as it prepares the ranch for the curious. The dedication opened with an official ceremony that included speeches by a number of notable local and political figures including the popular Senator Daniel K. Inouye. An astonishing 700+ people turned out to see the live hula, music and speeches - certainly an overwhelming amount for the park that had, for the most part, kept the announcements of the dedication to a minimum to avoid too much environmental damage. We arrived at 10:30 AM and the dedication ceremony had just begun. 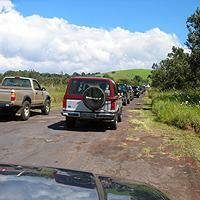 We were just one in a huge line of vehicles pouring into the ranch. An unbelievable number of park rangers, dressed in uniform were directing traffic and overseeing the event - some on horseback. We were directed past the first large parking area, which was obviously full, up the hill well past the ceremony to a huge old airfield landing strip. At about noon a car or two pulled up to the start of the drive and we quickly got into line and were relieved to be the 3rd vehicle. With 700 people there were probably 300 to 400 cars and we had no idea how many people were intending to do the drive (it turns out that well over 100 cars participated in the scenic drive). At about 12:15 the line had grown to the point where the rangers, who were waiting for the dignitaries to arrive and go first, decided to let the public go on ahead. We had been given maps with the trail marked and several stopping points of interest laid out. Each stopping point featured rangers to help explain the area and items of interest. The drive itself consisted of a 5.3 mile part that was open to any car, followed by a another 5 or so miles open only to 4-wheel drive, high clearance vehicles. If you did not have a vehicle capable of the final 5 miles you were turned back to return the way you came, otherwise the 5 rough miles completed a loop that took you back to the main road. At this point we reset our odometers. The first 1.9 miles of road went by open land that was a combination of lava from the 1868 eruption and grassland with small 'Ōhi'a Lehua growing about. At 1.9 miles was the first stop on the park map. From odometer 1.7 to odometer 1.9, on the left side is a tall fissure that runs along the ground. On April 7, 1868, this fissure opened and released huge quantities of lava for 15 days straight. The flow burnt everything as it moved towards the ocean, including the complete destruction of a fishing village. 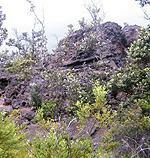 This was a part of the massive 1868 eruption of Mauna Loa along its Southwest Rift Zone. 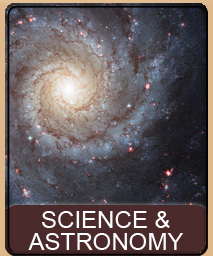 It all started on March 27, 1868 with constant earthquakes. Day after day earthquakes shook the island but on April 2nd the most devastating earthquake, estimated at over 8.0 and the largest earthquake to ever hit Hawai'i in recorded time, shook the island. This massive earthquake was followed by thousands of smaller earthquakes over a few hour period. The earthquakes caused massive damage in Ka'ū, including a half mile wide section of hill side which broke loose and avalanched an estimated 3 miles in 3 minutes. The avalanche completely buried a town to a depth of 20 feet including 10 houses, 31 people and 500 cattle. The earthquakes also caused a 75 mile stretch of shoreline around Ka'ū to subside about 7 feet, submerging many costal villages. Approximatley 108 houses were destroyed by the submerging land and the resulting tsunami and 46 people drowned. On April 7, 1868, a mile long fissure opened in Kahuku Ranch - and this is the fissure you see before you. The fissure fountained lava along its entire stretch as high as 200 feet in the air, setting all vegetation around the fissure on fire. As the flow reached the ocean, 9 miles from the fissure, it created a small temporary new island that had about 30 cattle trapped on it that could not be rescued for 10 days. 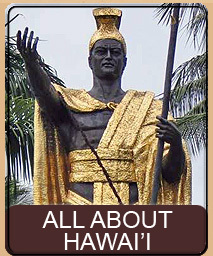 The ocean entry of the flow also created Pu'u Hou, the largest littoral cone on the Big Island at over 262 feet tall. An estimated 24 square miles of lava poured from the fissure. As we drove from the fissure towards odometer 3.8 we entered a very pleasant grassy rolling meadow dotted with Koa and 'Ōhi'a Lehua trees. As this is a working ranch we saw many head of cattle - all of which were intensely curious and were staring at the huge number of vehicles that were streaming past. 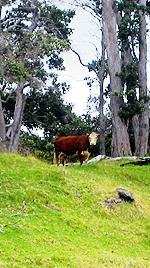 In one beautiful section, where the Koa trees were nicely spaced among the grass, behind each Koa peeked a cow head looking the procession, giving the impression of a setting in some bizarre spy novel. We noted that the fencing consists of not only your standard ranch barbed wire fence, but also two curious low strands. These turned out to be electric fence aimed at keeping wild pigs and goats at bay as well as keeping the cows in the right places. Much of the fencing around the ranch is electrified and the power is supplied by an occasional solar paneled device. At odometer 3.8 the park had setup picnic tables near an abandoned and crumbling catchment tank. It was a very pretty spot that offered a stunning view of Ka Lae (South Point) and the ocean and many families took an opportunity at this spot to have lunch and enjoy the wonderful view. From the scenic view of Ka Lae to odometer 5.3 the land continues with the beautiful grassy rolling hills, Koa trees and occasional small forests, and lots of curious cattle. A very picturesque and pleasurable drive, and most of the vehicles by this point had spaced out to the point that often you could not see a vehicle ahead or behind you. At odometer 5.3 the park stopped all vehicles and informed each of us that the rest of the trail required a 4-wheel drive vehicle with high clearance. Any vehicle that did not meet the merits of the trail was turned back to return the way it came. The rest of us were allowed on with a stern warning to give plenty of room to the vehicle ahead as there are many wet and slippery areas where you can not predict what will happen to the vehicle ahead - and as you will see, how true their warning turned out to be. From the 5.3 mile part to 6.3 we were really humored by all the warnings that the park had given us. The road was a bit grassy, but any car could easily have navigated it, regardless of clearance. We wondered what all the big 4-wheel hype had been about as we enjoyed the rolling hills and beautiful scenery. As we approached odometer 6.3 the road got a bit more hilly, but nothing any car could not navigate. At 6.3 the park had setup another stop point at a fabulous pit crater. Many people, as did we, chose this location for their lunch break. About 40 feet away from the parking area was a huge pit crater formed when the roof of a magma holding area collapsed suddenly. 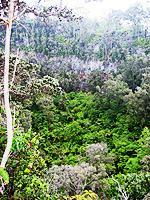 The resulting pit crater was very large, hundreds of feet across and at least 100 feet deep and was densely forested. The park rangers talked about the native plant and bird life that live in the area and the park's plans for protecting the area to encourage native plant and bird survival. Near the pit crater another curious herd of cattle stood eyeing the crowd of people and SUVs. A ranch hand was sitting patiently on an all terrain vehicle waiting for the cows to get up enough nerve to enter their holding pen. It looked like he would have to wait a very long time. Back in the vehicle, our bellies full, we continued past the now thoroughly bored rancher and down the jeep road. After a little bit we encountered a bit of a traffic backup. While it was difficult to see due to twists in the road and roadside trees, we could see that apparently people were sitting and waiting. Finally one vehicle would go ahead and the next would sit and wait. As we approached we could see that the road ahead went downwards fairly steeply and was very wet and muddy. 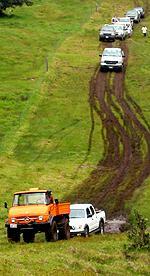 Furthermore, it was pretty rutted with deep tracks on either side. Obviously this is what the park ranger warning had been about and people were mostly heeding the advice to let the person ahead get all the way through before continuing. When it became our turn, we started down the muddy slippery slope and found that within a few feet our treads had become totally encased in mud. At this point we started doing what we saw the car ahead of us do... we started sliding not only forward but a bit side to side as well. Unfortunatley the person behind us did not heed the rangers warning and followed on our heels having to slam on their brakes and slide to keep from hitting us. The slippery slope would level out in places, causing another backlog of cars, which did nothing to help the ones coming from behind. Each level spot had another muddy decline after it, some much worse than others. But once we got to the bottom we decided that it had been pretty fun and both agreed that indeed, the rangers had been right on track. After the slide and before the 7.2 mile mark a long low rock wall appeared on our left. This wall marks the boundary between the Ka'ū Forest Reserve and the ranch. At the 7.2 mile mark the park had setup another stopping area where they had an exhibit of native plants and talked about how plants would be protected and the anticipated synergy between the new park land and the adjoining forest reserve. At the 7.2 mile mar was a right hand turn and again, a large backup of traffic. This was a fairly steep downward slope and we were about 8th in line but could not see the reason everyone had stopped. A ranger vehicle was a few vehicles ahead of us and the road was visible on a distant upslope but no cars appeared to be going up. After a bit, we realized that indeed the line was moving, but very slowly. A car would start down and go out of view and the line would not move at all. Time would pass but no car would be seen, then finally we would see it going up the distant slope. We wondered if there was perhaps a stream that had to be crossed, but still could not see. Slowly, the line moved forward and the backup behind us was getting larger and larger. Then the ranger went, again time past and finally he appeared on the far slope and pulled off the road and got out and walked back down out of view. Even with only two cars ahead, we could not really make out what was happening until the first car went down and we moved forward a bit. Suddenly we were over the lip and could see. The road went down a very sleep slope at the bottom of which was a mud puddle and a very muddy upslope. A few people including the ranger were at the base near the mud puddle and as the cars ahead of us went down you could see the ranger giving instructions on how to drive. Each car ahead of us had trouble but appeared to follow the ranger's advice and made it up the other slope. Now it was our turn, and down we went with mud-caked treads. Near the bottom we were told to avoid going in the very long grass as the side of the road because it hid several deep holes - but instead go through the mud puddle then quickly veer left and straight to avoid another hidden hole. We did and up the other side we went. We pulled off the road near the cop car as this looked like it was going to be entertaining. Behind us, by a car or two, was a very unusual Mercedes truck that was bright orange and resembled an oversized Tonka Truck. The truck had huge tires, deep treads and even a snorkel so it could go through water. It, of course, had absolutely no problems with the road - totally amazing. It pulled off the road near us as well and the driver got out and headed down the hill while his wife got out and joined us. At this point it started to get very entertaining. With each vehicle the road was slowly getting worse and worse, and the backup of vehicles longer and longer. Now, about one out of every five vehicles was not getting through and was getting totally stuck. Many did not heed the ranger's advice and would get stuck in the mud holes. The ranger and others would try to push them, very dangerous because everything was slipping forward, backward and to the side - and sometimes would get them going. In the situations where they were truly stuck, the owner of the Mercedes Tonka Truck backed down, winched up the car and drug them up the hill. As time went on, cars who successfully made it up the hill often pulled off and joined us - while just about everyone who got stuck kept going. After a bit we had a pretty nice crowd on our side cheering on each attempt and groaning and offering our expert advice when people got stuck. The other side, due to the huge backup, also had a cheering and groaning crowd forming. Time after time we watched the Tonka Truck go down the hill and relentlessly pull another stuck vehicle out. Strangely, we noted that most of the vehicles that got stuck were Chevy and Ford, while the other makes were getting through. At the highlight of the event a man in a beat up truck, when it was his turn, decided that he had a better plan and would drive completely on the wide grassy area to the right of the road. He gunned the truck and tore down the hill while the ranger and people at the bottom scrambled out of the way and were yelling for him to get back on the road. Everyone around us instantly realized what was going to happen as the man was speeding to the base, and towards a large hidden hole in the grass. Upon reaching the bottom, and the hole, he hit it solidly and came to an instant stop. Everyone hooted and hollered and down the hill the Tonka Truck rumbled and had to first tow him backwards out of the hole, and then forwards up the hill. The driver hid his face as he went by but you could see he was laughing. All in all, this final event seemed to be totally enjoyed by everyone involved. The people who were successful would cheer and yell, "that's how you do it" and the unsuccessful would still be laughing. The Tonka Truck driver seemed to be enjoying himself but it was obvious that it would be a very long afternoon for everyone involved. We heard that they had stopped allowing 4-wheel vehicles onto the jeep trail to stop the backup of traffic, but many many cars still were waiting to go down the slope when we decided to move on. If it were not for the wonderful man in the Mercedes truck who donated his time, gas and truck for pulling out all of the stuck SUVs, this very entertaining event would have probably come out a totally different way. Within a mile or two after the mud bath, through more beautiful meadows and stunning views of the coast, we returned to the main road at a junction and followed our original way in, back out. It will be interesting to see how the park changes the ranch land and expands the roads and trails. We applaud the park for opening the ranch to the public in its wild state and allowing us to enjoy the beauty and nature of the ranch. 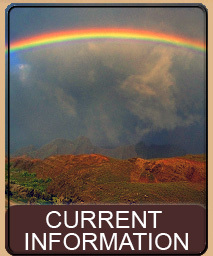 This page is named 'Drives.kahuku'. Can't Find It?